Production facilities in Swadlincote, South Derbyshire and Cwmbran, South Wales ensure a consistent supply chain for our customers throughout the UK. Health and safety is a major priority for the modern house builder. 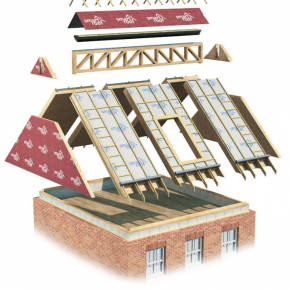 The Smartroof system reduces the time required working at height as well as eliminating the risk of falling gables delivering a safer working environment. While a traditional roofing system requires days to complete, the Smartroof system can be installed in a matter of hours, helping house builders to achieve deadlines as well as providing a 100% budget certainty. The supply and install option guarantees a fixed price for the job compared to traditional methods which often have cost over-runs due to the use of multiple trades and are susceptible to delays caused by material supply or weather disruption. 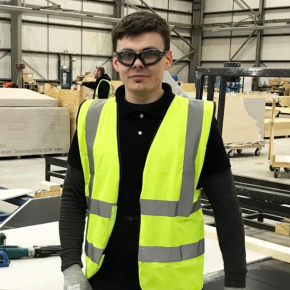 Research has shown that manufacturing in a factory environment dramatically improves both the adherence to quality standards and the absolute quality of building components produced off-site in this way. Smartroof is a top quality roof, reflected directly by the thermal performance figures indicating the dimensional accuracy and quality of insulation within the interlocking panels. Smartroof offers consistent and predictable thermal performance which can be computer modelled in advance to aid design enhancement and accurately assess an individual building’s efficiency at the design stage. The build quality at our gable, eaves and party head junction details helps to facilitate excellent Fabric Energy Efficiency ratings and contributes to performance targets in a Zero Carbon Home.